You could ask any deer hunter how the herd is in their area and get a different answer every time. We all want the best habitat, doe to buck ratio and a very limited number of predators in our area. What I didn’t know, is that like moose here in Maine, we have deer that are collared and monitored in order to help biologists understand the true health of the deer herd. I sat down with Maine’s deer biologist Kyle Ravana to ask him about the collaring program and what he (and IFW) hope to learn from it. Where are the deer that are being collared? And why those WMDs? Right now, we have deer collared in WMD 17 and 6 and want to expand into either WMD 8 or 1. 17 is good because there is usually a good mix of snow pack levels and human population numbers. 6 is almost split into two regions; the west that has the big woods and the east that has farms and urban areas. We really want to get a slice of every possible habitat the deer live in so that we can have a thorough idea of what our deer are experiencing. What are you hoping to learn from the collaring program? 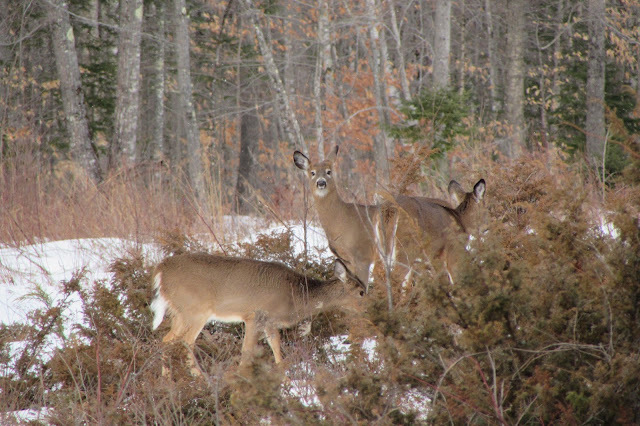 We are looking at a bunch of information; winter severity as it relates to winter mortality, how deer are using the landscape, where they are yarding up, how they are adapting to their habitat, and where they are traveling. We also have 27 weather stations that we get information from that gives us temperature information, snow pack amounts and deer-sinking depths. What are deer sinking depths? Exactly what it sounds like. If we get one or two feet of snow, it is hard for the deer to move around but if there is a layer of crust that forms on the top of that snow that they can walk on, it doesn’t matter how much snow is below it, because they deer can walk on the crust and move around fairly well and still access food sources. How do you trap a deer? We have a variety of ways. A Clover trap is like a large Have-A-Heart. We jump into the trap with the deer and can usually get back out and send the deer on its way in just a couple of minutes. The key to this whole process is to stress the deer as little as possible. We can also use a drop net, rocket net or a dart gun. Our goal is to have 45 deer collared in each WMD that we are in. Which deer are you collaring? We will put permanent collars on does, ear tags on bucks and for any yearlings that we get, we put on a temporary collar that has a piece that biodegrades in about 6 months and falls off. Then, we can go back and retrieve the collar, replace the piece that wore away and use it again. How can you tell if the collar has fallen off? We monitor all of the collars. If any of them have not moved in 3-4 hours, then we go out and retrieve the collar to see what is going on; did it fall off or did the deer die. Will this help you get a better idea of predation on deer? It could. It will let us know how many deer are dying and what the cause was. That information will help us with the overall index that we use. We take all of the data that we collect and plug it into a matrix. We look at how the numbers compare year to year and that gives us an idea of the overall health of the deer population. What I am trying to do now is update our measurement tools with recent information and update the matrix so that our overall index is more accurate and relevant to what our deer are experiencing now and not twenty years old. Do you use the index to determine any-deer permits? That’s a part of it. We manage on a WMD level so if there are high mortality rates in certain WMDs, then we can add or take away the number of permits that we issue per year. Does this collaring study fit in with the new management plan that your committee, the steering committee and Department have been working on? Yes and we really want the public to read the plan and add their input when it’s time. We know that there are concerns about Lyme, ticks, car accidents etc. We want to make sure that we are doing what is right for the entire state’s herd and not just managing the deer for hunters. We really want to hear what everyone has to say about the management plan. Kyle and I then got into a conversation about people feeding deer in the winter. You can read more about that here.